Create ability-based groups based on reading groups or most recent assessment. Create a web or wheel graphic organizer with "summer" at its center. Print the organizer and provide a copy to each student. During the first five minutes, students brainstorm individually and jot down ideas on the organizer. Student task: List favorite summer activities (swimming, camping, traveling, working, and so on). The teacher circulates to help students stay on task and cultivate ideas. Identify one child in each group as facilitator to direct discussion. During the next ten minutes, students in each group discuss and add to ideas generated by individual group members. During the last five minutes, each student finalizes his or her own organizer, then looks for another student to help if time allows. Provide each student with another blank organizer (the same one or another of your favorites). For the first five minutes, students individually brainstorm to identify terms and issues they associate with summertime reading. Return to students' previously created organizers. Based on a review of the organizers, pair students with similar interests and similar planned summertime activities. Visit the school media center or public library. Invite students to use their organizers as a guide to search the library -- as well as online bookstores or library catalogs -- for titles they're interested in. Students list specific reading materials, based on their discoveries. The titles and authors of materials they'll read. Three student-recommended rewards for meeting their goals. A specific plan of action with interim mini-goals. *If several students are interested in books not readily available, use a writing assignment to teach the format for a business request or thank you note. Groups can ask the public or school library to order a particular book, or students can solicit support from a local business to help purchase the book for the school or classroom library. Send the draft reading plan home with each student. Explain that their assignment is to discuss the plan with their parents and make a note of edits, concerns, and new ideas. Students also should indicate which reward for meeting those goals they've selected. Students create a border for their final plan using brightly colored paper or their own art. They incorporate into the plan blanks where they can list what they read, lines for student and parent signatures, and all other needed components. Have students execute the "contract" with their parents and then return a copy to you. They should keep the original for summertime use. With parental permission, set up a summertime e-mail to encourage student progress. Otherwise, recommend that students communicate with other students in their group. Coordinate with next year's teachers to provide a beginning-of-school reward for students who meet their goals. 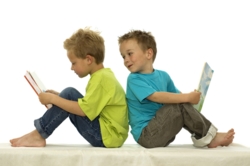 Set aside 20 minutes for independent reading twice weekly until the end of the school year. As part of end-of-year festivities, celebrate student progress to date and encourage continuing progress. Also, provide parents with tips for incorporating reading into their summer plans. Use the same strategy throughout the next school year to encourage reading inside -- and outside -- the classroom.